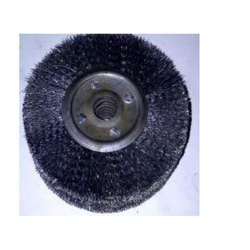 We are manufacturing all type of wheel brush inall different size and material. Brass Wire Brush made with bases like plastic, wooden or any metal base. Wire gauge varies from soft to hard depending on application areas. Our 7 row hard & 10 row hard brass wire brushes are very popular in pharma industry for blister packing machine's hot knurled roller cleaning. Available in GMP model also. Various other shapes & sizes are also available as per specifications. 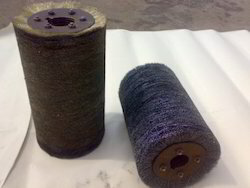 We are remarkable enterprise, involved in offering superior quality Wire Brush. Used for burr / enamel removing. Made of fine quality M.S. Wires. Catering to the demands of customers as a reliable organization, we are offering Wire Round Brush. Provided in customized specifications, these round brushes are widely demanded in the market.